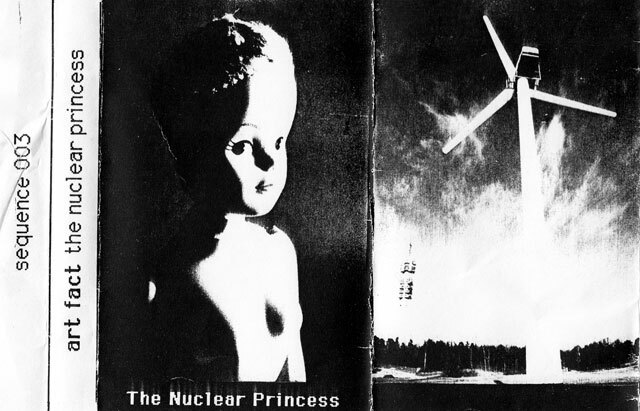 All right, with last week’s depressing “Wasted Minds” we are done with our cassette Nowadays and move on to our last “real” demo, “The Nuclear Princess”. I don’t remember how much time passed between finishing “Nowadays” and starting on the songs for this demo. Something that is obvious right from the start is that we had a bunch of new equipment. We had started working more on a regular basis out of Jonas’ home where his brother had a studio set up with more stuff for us to borrow. On this first track from TNP, we are using almost the full battery of new equipment. We have a slightly-out-of-tune (we didn’t hear that it was sour until after mastering) Roland Alpha Juno-1 playing a whining pad in the intro, and we were also using a Roland S-330 sampler, together with an Ensoniq EPS and our trusty Roland Juno 106. We were also using a computer with sequencer software for the first time. A version of Opcode Vision made it easier for us to make our songs more complexed and layered, but it also made it easier for us to get bogged down into details. The opening track then. “A New Book” continues on the anti-religion theme from “Nowadays” with lyrics condemning people following the letter of the bible. I don’t know why we chose this song as the opener, but it kind of sets the tone for the whole demo and new sound of Art Fact. Slower, darker and supposedly deeper. At least that’s what we thought at the time. This song is not one of my favorites, but it’s not the worst either. It has a couple of nice melodies and cool reverse sampled speeches. My vocals are OK, doing the job but void of most of the emotion present on our earlier songs. This was very much the idea at the time, but now I think that was a bad choice. We had more of a unique sound going on when we had my “blues-y” vocals on top of the electronic sounds than when we tried hard to sound more like every other Swedish synth act at the time. Next Next post: A Song A Week #26: Can You Believe?